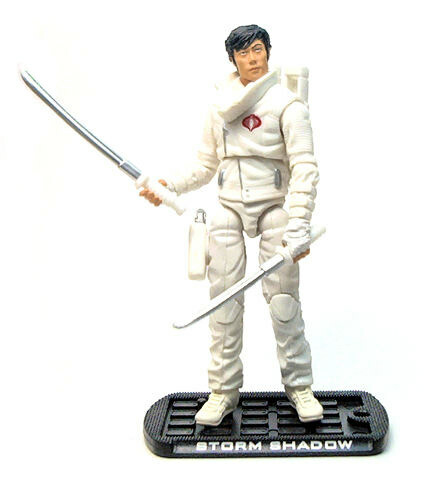 Hasbro released the Storm Shadow (Paris Pursuit) figure in 2009 as part of the second wave of figures from the G.I. Joe: The Rise of Cobra line, based on the appearance of the character in the motion picture of the same name. So, let’s start by saying that this is not a movie accurate rendition of the outfit Storm Shadow wore in the Paris Pursuit segment of the movie. It’s a generally acceptable approximation, but certainly not what we saw on the screen. The reason, I guess, is that the actual costume was nowhere near as exciting to look at, consisting in little more than a white leisure suit. This version depicts Storm Shadow wearing what appears to be a white leather biker outfit. The upper half is covered with a stylish leather jacket, detailed with sculpted zippers, straps and ribbed panels on shoulders and the upper arms. The legs are covered with white slacks, sculpted with protective kneepads and the appropriate folds and wrinkles. A rigid plastic holster is attached to the right thigh, but it doesn’t look nearly as detailed as the rest of the costume. In contrast, Storm Shadow wears what appears to be regular sports footwear, sculpted with very crisp, realistic detail. The head sculpt is quite impressive, for the size. As far as likeness goes, it may not be that close to actor Byung Hun Lee, but the head still manages to capture a passing resemblance, due to the broad ethnic traits it has. The hair is sculpted reasonably although it’s advisable to examine the hairline for paint errors before picking this figure at the store. Storm Shadow (Paris Pursuit) is molded entirely in an off-white plastic with a barely noticeable yellowish tint to it. Not surprisingly there are very few paint applications on this figure, consisting on little more than the zipper and a few buttons on the jacket, as well as the token red Cobra logo over the left breast. Here the paint is mostly well applied, but again, check the Cobra logo at the store for inconsistencies. The rest of the paint operations go onto the hands (only the finger tips are painted in skin colored paint) and head. I must say that even though the paint job on the head is rather simple, the combination of a really good skin tone and the ethnic aspect of the sculpt provide very subtle lifelike shading to Storm Shadow’s face. All of the samples of this figure I saw at the store shared the same intense stare, similar to that found on portraits where you feel the eyes following you as you move across the room, which I find is a very cool effect. • Ball jointed neck. Allows for reasonable side-to-side swivel due to the jacket collar and very little tilt all around. • Peg & hinge shoulders. Excellent motion range all around. • Peg & hinge elbows. Bending range is slightly short of 90° back and forth, but allows for 360° sideways rotation. • Ball mounted torso. Free 360° swivel and decent tilting back/forth and sideways. • Ball jointed hips. Pretty good motion range all around. • Double hinged knees. These bend way beyond 90° and are quite well hidden from view. Other than the neck, the overall motion range on Storm Shadow is pretty good, although I must note that the torso on my copy swivels a little too loosely. Storm Shadow comes with a pretty good accessory selection. There are his token two swords (katana and wakizashi, respectively), two sai, a pistol and the dual sheath for the swords. The sheath plugs onto his back like a regular backpack, and it holds both blades securely. The pistol is one of those futuristic-looking sonic guns from the movie, like the one that came with Destro, only this time the gun is molded in white and painted silver. This gun fits the holster at his right thigh rather tightly. Like most other figures in the line, this version of Storm Shadow comes with an oversized launcher and a weird suction cup that has bike handlebars on top. Now, I prize myself as being rather imaginative, but for my life I cannot come up with a reasonable purpose for this thing, other than having Storm Shadow posing as a maintenance worker removing the glass panes at a lobby. Still, the suction cup does work fairly well and I’m sure some uses can be found for it eventually. Lastly, a display base is also included. This is made out of black plastic, and it has the Cobra logo at the underside and the characteristic rectangular bump texture on top along with a couple of pegs for the figure to stand. The front displays the name of the character in silver, using the same font as the movie logo. One chief complaint about the movie is the way the visual identity of the characters has been altered to fit in with modern Hollywood sensibilities, and I must admit that there is not a lot of ninja in here. If anything, Storm Shadow (Paris Pursuit) looks more like a modern yakuza (Japanese mafia) than ninja master, but then again, the fact remains that this is a fun figure to have, and his looks are distinct enough to warrant a place in my collection. That motorcycle pic is pretty cool. But, it brings to mind a question. There seems to be a number of items that involve Snake Eyes and Storm Shadow with motorcycles. Was there a motorcycle sequence cut from the film? Also, where is his bow? That is the weapon other than a sword I remember him using and was disappointed not to see it in the film. As for the bow, well, I don’t recall Storm Shadow using one in the movie either, but I’d definitely have liked it better if they had thrown one in instead of the suction cup.